Taken in 1948, this photo shows Ernest C. Clendenen, at the age of 81, leaning on his 1936 Chevrolet truck. This workhorse of a truck was used in the orchard as well as making pickups and deliveries. When E. C. bought the producing apple orchard, he first packed and shipped apples in wooden boxes that were sold on the San Francisco wholesale market. In 1909 this was an overnight horse-and-cart trip to the docks in Eureka from Fortuna! From the Eureka docks the apple boxes were loaded onto a steamship for the voyage to San Francisco. Word was sent back from San Francisco that one of his shipments had spoiled, and that he wouldn’t be paid for his apples. Wanting to see for himself, E.C. boarded the next steamship, and upon his arrival in S.F., found his apples in perfect condition in the unscrupulous dealer’s warehouse. 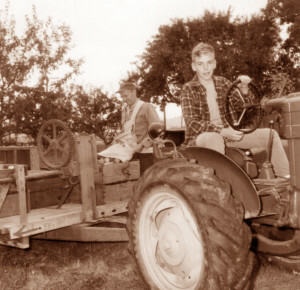 The old dairy barn across the street from the orchard soon had a small cider press, and the Clendenen’s started pressing and selling fresh apple cider. After struggling with a manual basket-type press for a few years, Ernest purchased the Mount Gilead No. 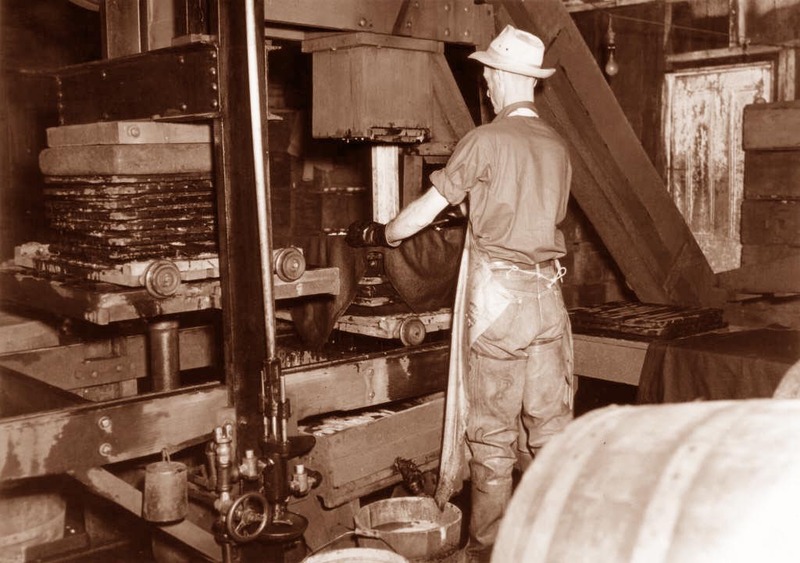 4-C Hydraulic Cider and Fruit Press in 1916, a room-sized machine that was shipped from Mt. Gilead, Ohio. 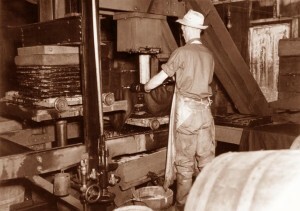 Powered by an electric motor, it was capable of producing 100 gallons per hour, allowing uninterrupted pressing while the next batch was prepared. 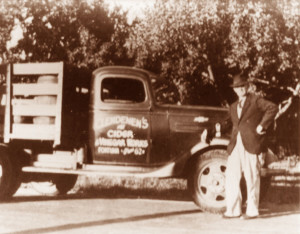 During Prohibition, the cider press ran nearly every day during the apple season. Apples from numerous local orchards were harvested and brought to Clendenen Cider Works for processing to supply the demand for a fermentable juice. Andy Clendenen pressing apples with the Mount Gilead Cider and Fruit Press. Less than a year after E. C. and May purchased the land, in January of 1909, May gave birth to their son Andrew in the house that is still being used by the family today. Andy Clendenen rejoined his father in the family business in 1948, after delivering fuel for Shell Oil Company, and serving in the South Pacific during WW II. In 1960 he moved the business across the street and into a new 1,800 square foot building. It was constructed by the Fortuna firm of T & H Construction and cost $3,829, not including plumbing, electrical or painting. The quality of construction and choice of materials has allowed the building to withstand several major earthquakes over the past forty years. Young Clif Clendenen with father Andy after harvesting apples. Like his father, Andy, Clif took to the business at a young age. Today, Clif and his son Drew are picking apples, pressing, which happens roughly every five days, and welcoming visitors to sample a drink that varies in taste as different varieties become ripe. Clif and Drew blend varieties and each pressing has its own unique taste and texture.